Robust Q1 growth was driven primarily by increased investment from advertisers in Digital Out of Home formats, according to our latest quarterly review of the Out of Home (OOH) sector. On-street Digipanels in Dublin city centre were launched in Q1 and have been a popular choice for advertisers. Combined with other strong performing digital formats such as Tesco Live and dX Screens, the market share for digital has increased to an all-time high of 22.5%. This will grow further as the year progresses, according to the Out of Home marketing agency. It also reports a strong start to the year for roadside 6 Sheets and T-Sides on buses. Top spending category for Q1 was Finance, followed closely by Retail. Banks, such as Bank of Ireland and KBC, and supermarkets such as Lidl and Dunnes Stores, have contributed heavily to these figures. Telecoms brands are back among the top spending advertisers again, with Vodafone and eir featuring prominently early in 2019. 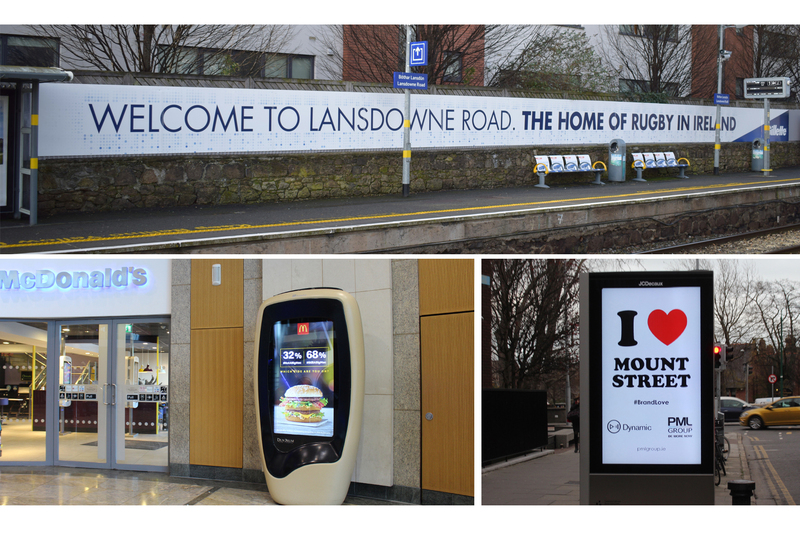 Much of Vodafone’s OOH spend in Q1 was based around Ireland’s Six Nations rugby campaign. Other brands to leverage their rugby links on OOH in Q1 included Guinness, Aer Lingus and Gillette. Indeed, the P&G owned shaving brand even took over the entire Lansdowne Road DART station to maximise exposure to fans in the area. Other campaign highlights from Q1 included McDonald’s using PML Group’s Liveposter platform to display live poll results on their ‘Still a Big Mac’ vote. Boylsesports also used the platform to count down live to all 28 races during the Cheltenham festival. Diageo, McDonald’s and AIB Group were the top three spending advertisers on the medium in cycles 1-7. Other banks among the top ten were Ulster Bank and Bank of Ireland, who launched their new ‘Begin’ campaign on OOH in cycle 7.